For a taste of royal lifestyles of raja-maharajas of Rajasthan, I set out on a heritage tour to this culturally rich land of India. 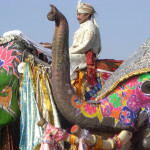 And fortunately my tour coincided with the famous elephant festival (which coincides with Holi) celebrated with great fervour in the capital city Jaipur. The capital is at its best when decked up for this colourful and unique festival. After reaching Jaipur I was eagerly waiting to participate in the festival. To experience the royalty at its best I stayed at Alsisar Haveli, which is one of the finest heritage hotels in the city. Its Rajputana look, traditional architecture, stunning interiors and warm hospitality left me speechless. Staying at this hotel was in itself a royal experience. Everything from bed to the mirror in the washroom had a royal touch to it. To begin with I along with Manoj, my guide, visited the City Palace, a fabulous example of Rajasthani and Mughal architecture. The palace complex houses several stunning palaces with dazzling interiors. Further we headed to Jantar Mantar, a collection of astronomical instruments built in stone for measuring the planetary movements and time. Then we explored Hawa Mahal (Palace of Winds), a pink coloured five-storied structure pierced with 955 windows. It was built in 1799 to enable the royal ladies to view the city life, without being visible themselves. Then we moved on to Amber Fort, the huge fort with several arresting structures built under the reign of Raja Man Singh. We take an Elephant ride to reach the Fort situated on the hill, a fascinating experience. 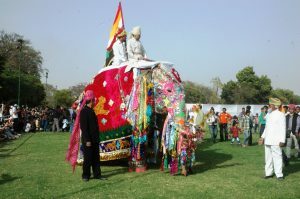 Next day I was ready to be a part of the famous elephant festival, commemorating the glorious past of the city. The view of the elephants adorned from head to toe was a sight to behold. The elephant race was simply overwhelming. They also played the royal game polo and a procession of elephants is taken out. I felt as if the elephants were also enjoying themselves. 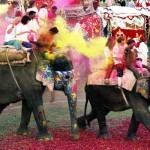 For me the most fascinating part of the festival was playing holi on an elephant’s back. I also enjoyed traditional folk dances of Rajasthan. I was completely soaked in the hue of Rajasthan. «Next Post Sariska National Park- A Journey High On Expectations!